Mother Teresa once said, “Give your hands to serve and your heart to love.” Carmen and Eddie Tolentino are a true testament to the blessings of sharing by giving their time to the Skid Row community. 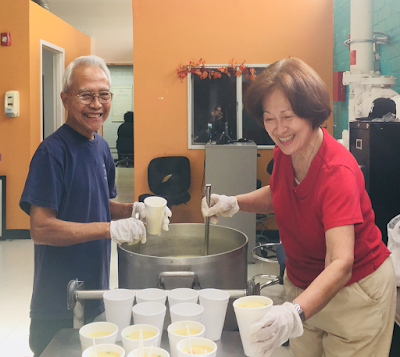 Since 1994 Carmen and Eddie have dedicated their time by making hot ramen noodle soup every Tuesday to the drop-in clients of the Cardinal Manning Center (CMC). They also make dinner once a month for the residents of the CMC. Their story begun in 1986 when Carmen began volunteering with the Lady of Miraculous Medal Vincentian conference. She was introduced to, and gradually became involved with the CMC, assisting with day to day tasks in the drop-in center. Meanwhile, Eddie volunteered with the nonprofit organization, Meals on Wheels. After both volunteering with different organizations, Carmen and Eddie decided it was time to share their blessings together and developed their plan to provide hot ramen noddle soup every Tuesday to the drop-in clients of the CMC. For Carmen and Eddie it is more than just making a meal, it’s about getting to interact with, and truly sharing their compassion and joy with members of the Skid Row community.